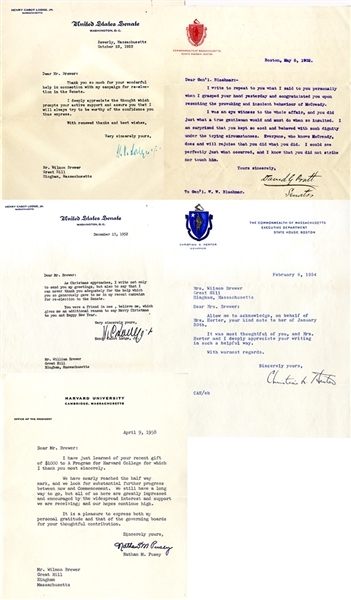 Group of five (5) Massachusetts politicians items , includes: HERTER, Christian Archibald 1895-1966) was an American politician who was the 59th Governor of Massachusetts from 1953 to 1957 and United States Secretary of State from 1959 to 1961. Typed Letter Signed “Christian A. Herter” 1pp. quarto, February 8, 1954, on Executive Department of Massachusetts letterhead, with cover. Fine condition...plus; LODGE, Jr., Henry Cabot 1902-1985), sometimes referred to as Henry Cabot Lodge II, was a Republican United States Senator from Massachusetts and a United States ambassador. He was the Republican nominee for Vice President in the 1960 presidential election alongside incumbent Vice President Richard Nixon. The Republican ticket lost to Democrats John F. Kennedy and Lyndon B. Johnson. Typed Letter Signed “H.C. Lodge” as U.S. Senator, 1pp. quarto, December 17, 1952, being a Christmas greeting and thank you letter for campaign donations. Fine condition...plus; PUSEY, Nathan (1907-2001) as the 24th president of Harvard University (1953–1971). During his presidency of Harvard, Pusey overhauled the admissions process, which had been biased heavily in favor of the alumni of New England-based boarding schools, and began admitting public school graduates on the basis of scores obtained on standardized tests such as the SAT. This was highly controversial with the school's alumni population, but set the stage for the diversification of the student body and faculty. Typed Letter Signed “Nathan M. Pusey” 1pp. quarto, April 9, 1958, thanking a donar for a $1000 gift to Harvard. Fine condition....plus; PRATT, David G. (b. 1848) Republican. Banker; delegate to Republican National Convention from Massachusetts, 1904; member of Massachusetts Governor's Council 1st District, 1906. Typed Letter Signed “David G. Pratt” 1pp. quarto, May 8, 1902, addressed to General Blackmar and reads in small part: ...I write to repeat to you what I said to you personally when I grasped your hand yesterday and congratulated you upon resenting the provoking and insolent behaviour of McCready. I was an eye witness to the whole affair, and you did just what at true gentleman would...I could see perfectly just what occurred and I know that you did not strike nor touch him...” Fine condition....plus; LODGE, Jr., Henry Cabot 1902-1985), sometimes referred to as Henry Cabot Lodge II, was a Republican United States Senator from Massachusetts and a United States ambassador. He was the Republican nominee for Vice President in the 1960 presidential election alongside incumbent Vice President Richard Nixon. The Republican ticket lost to Democrats John F. Kennedy and Lyndon B. Johnson. Typed Letter Signed “H.C. Lodge” as U.S. Senator, 1pp. quarto, October 23, 1952, being a thank you letter for campaign donations. Fine condition.